Directions: (Exit 171) US 101 at Main Street-State Highway 166 in Santa Maria and drive west 11 miles to the gate and kiosk marking the entrance to Rancho Guadalupe Dunes County Park. Continue past the kiosk about 2 miles to reach the beach parking area. From the parking lot a short walk north on the beach takes you to the river estuary, while a long trek to the south takes you to Mussel Rock. Note- much of the estuary and inland dunes are closed during the Western Snowy Plover and California Least Tern nesting season from March 1 - September 30 each year. Access to the beach parking lot may be closed during county work furlough days or inclement weather. Call (805) 343-2354 for access information prior to visiting. 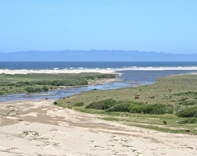 Rewards: Positioned on the Santa Barbara-San Luis Obispo county line, the mouth of the Santa Maria River is without question one of the best shorebird sites in all of coastal Santa Barbara County. It is recognized as a National Audubon Society "Important Bird Area" as part of the Santa Maria River Valley (link >>). You can park just outside the entrance gate and bird the willow-riparian habitat and pasture along the road all the way to the sand mining plant to look for resident birds and migrant passerines. During fall migration (late June through October) the estuary can be teeming with activity as sandpipers, wading birds, pelicans, gulls and terns stop and feed here in large numbers. When the estuary is flooded, waterfowl are often present along the eastern shoreline and may include geese and swans. Pelagic birds can be spotted offshore and regularly include loons, grebes, scoters, shearwaters and the occasional alcid. The list of rare birds found here is long! 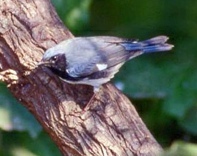 Numerous vagrant warblers have been found in the willows during fall migration. Directions: (Exit 171) US 101 at Main Street-State Highway 166 in Santa Maria and drive west approximately 9 miles to the town of Guadalupe. Continue past the cemetery and four way stop at West Main Street and Highway 1 intersection to Jack O'Connell park a few blocks to the west. Just beyond the Riverview subdivision of homes take Calle Ceasar Chavez to the right to the parking lot. The sewage plant is not open to birders but a portion of it is visible from the north edge of the softball field. Rewards: Hiking to the beach offers incredible views of the ocean below Point Sal Ridge and northeast into the wide Santa Maria Valley. However, reaching the actual beach requires a long hike and should not be attempted late in the day. Birding the riparian habitat along Brown Road in Corralitos Canyon can be quite good in spring with kingbirds, flycatchers, grosbeaks, tanagers, migrating warblers in the mix, and several interesting birds may be found on the grassy crest of Point Sal Ridge. The birdlife of Point Sal is busy with Brown Pelicans and gulls, winter loons, grebes, and "rockpipers" are regular where the surf pounds these coastal rocks. The relatively sheltered bay at Point Sal Beach is good for wintering scoters and alcids. Additionally, the open fields and grassy slopes of the area is good for Golden Eagle and Northern Harrier. Directions: (Exit 171) US 101 at Main Street- State Highway 166 in Santa Maria and drive west through town approximately 4 miles to Black Road. Turn left (south) on Black Road to reach the entrance about 1/4 mile on the right. The management is very accommodating to birders, but you must sign in at the office prior to birding. Vehicles are allowed to drive around the settling ponds if there is no heavy equipment operations. Inquire from the office what areas are closed to vehicles. Hours are Monday - Friday from 8:00 to 4:00. Note: Typically the third Friday of each month is a work furlough day and the sewage plant will be closed. Rewards: The Santa Maria Wastewater Treatment Plant is most productive in spring, fall and winter. When water levels are low there can be good numbers of shorebirds feeding in the muddy shallows during spring and fall migration. Waterfowl are usually found in the flooded ponds to the west of the facility by driving around the settling pond levees. Irregular breeders include Black-necked Stilt and American Avocet. 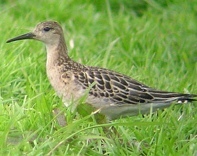 Sandpipers are often abundant in fall migration which can begin in late June. Yellowlegs, dowitchers and phalaropes are commonly seen here. A check of the clarifying tanks will show approachable gulls in winter with the occasional Thayer's Gull in the mix. Several rare birds have been recorded at this location. A county first Spotted Redshank in October of 1985, a second southern California record, was discovered in adjacent pasture fields (no longer here). These Santa Maria area parks are well worth exploring. Each offers a uniquely different habitat type in the Santa Maria Valley with a nice variety of birds at different seasons. Directions: (Exit 169) US 101 at Betteravia Road and drive west to South Broadway (State 135). Turn left (south) and continue to Waller Lane or Goodwin Road and turn right (west). The park entrance is located at 3107 Orcutt Road which parallels Broadway-135. A second entrance is on Goodwin Road. Directions: (Exit 173) In Santa Maria exit US 101 at North Broadway (State Route 135) which is the northern most exit into Santa Maria and head immediately south. Turn right (west) at Preisker Lane and drive to its end at Hidden Pines Way. Turn left (west) to reach the park entrance on the left. Rewards: Preisker Park is Santa Maria's largest city park at 40 acres. The pines, holly oaks, sycamores and alder trees can attract several western migrants in spring and fall, and the occasional winter vagrant. Lawrence's Goldfinch and Allen's Hummingbird nest here. Sapsuckers are regular in winter in the pepper trees scattered throughout the park. Warblers frequent the pines in fall and winter. Directions: (Exit 172) In Santa Maria exit US 101at Donovan Road and immediately take North Carlotti Drive on the east side of the overpass next to the corner market. Drive north about two blocks to East Stanford which is just before the elementary school. Turn left (west) on East Stanford until you reach the park on the right. To reach the river levee trail continue to the end of North Carlotti Drive at Seaward Drive. Rewards: James "Jim" May (formerly River Oaks) Park is a recent city park addition utilizing two flood retention ponds. The lake portion alone is more than 11 acres in size. A pathway encircles the entire area for easy walking, and there is a observation deck next to the main park area. These ponds are home to one of the larger breeding colonies of Great-tailed Grackles in the county. This can also be a reliable place to test your skills at identifying winter gulls as they make their daily pilgrimage from the coast to the inland city landfill, and back again in the late afternoon. When gulls drop into the lake there can be many gulls present, roosting on the shore, and bathing in the lake. American White Pelican is occasional in winter and spring in small numbers. Occasionally in late summer and fall shorebirds are spotted along the muddy edges. Rarities have been mainly found in fall and winter months. Rewards: This 2.8 square mile Santa Maria Valley regional park opened in June of 2009 and consists of 1,774 acres of open space and trails located in the Solomon Hills east of Santa Maria. There are 11 miles of trails available for exploring, and the birds found here are typical of coast live oak and oak savanna habitat. Bird species include several California specialties. Spring land birds move through the oaks and narrow canyon riparian areas during migration and include flycatchers, kingbirds, grosbeaks and warblers. Directions: (Exit 164) US 101 south of Santa Maria exit at Clark Avenue and continue west toward the small town of Orcutt. At South Broadway-State 135 turn left (south) onto 135 (becomes Highway 1) and drive approximately eight miles to reach the slough. Be sure to veer right at the Highway 1-Highway 135 junction about 4.5 miles south of Orcutt (not going under the bridge). Continue over the hill and down to the bottom of the valley. Turn left (east) onto San Antonio Road East from Highway 1 which is just beyond the bridge. Barka Slough is also accessible from US 101 in Los Alamos by driving west 9.5 miles on State 135 to San Antonio Road East. Birding is best along a two mile stretch closest to Highway 1. Park where safe to pull out and do not trespass into adjacent private property. Rewards: The dense willow-riparian habitat here is excellent in spring and summer for a host of local breeding specialties. Regular nesting birds include flycatchers, chickadees, buntings and grosbeaks. Swallows are often seen over the slough and at the western boundary closer to Highway 1. Yellow-billed Magpies occasionally stray into the oak-covered hills at the slough's east end. Directions: From H Street-State Highway 1 in the city of Lompoc take West Ocean-State 246 and drive west about 8 miles to Ocean Park Road on the right as you approach the coast. Continue on Ocean Park Road to its end to reach the parking lot at Ocean Beach County Park. Return to 246 and continue south a short distance to reach Surf Beach. Note- the beaches are closed during the Western Snowy Plover and California Least Tern nesting season from March 1 - September 30 each year. Birding is permitted all year around the park but do not trespass into the adjacent estuary habitat, closed beaches or Vandenberg AFB property. Directions: (Exit 140A) US 101 in the town of Buellton at State Highway 246 and drive west 25 miles to Purisima Road (right) as you approach the city of Lompoc. Drive about 1 mile to the La Purisima Mission entrance on the right. Rewards: In addition to enjoying the rich history of La Purisima Mission, a stroll through the central garden trails or pathways into the brushy chaparral slopes can be good for a variety of common western birds. Regular species include Purple Finch, Western Bluebird, California Thrasher. Bell's Sparrow (rare) may be found in the chaparral. A check of the riparian habitat along the stream in spring is good for migrant passerines such as tanagers, flycatchers, warblers and vireos. Directions: From West Ocean-Highway 246 in the city of Lompoc drive south on "I" Street into the adjacent canyon which becomes San Miguelito Road. Continue south 3.5 miles to the park entrance on the right. Drive beyond the park entrance to reach upper Miguelito Canyon, San Miguelito Creek, and ridge of the Lompoc Hills. Directions: River Park is located in Lompoc off State Highway 246 near the Highway 1 junction immediately east of the Santa Ynez River bridge. Drive the entrance road into River Park and park in one of the lots near the end of the road. Sweeney Road is opposite (south) of the River Park entrance. Sweeney Road terminates approximately 5.8 miles ahead, but a good position overlooks the river at a pull-out about 1 mile on the right. Birding is only permitted from the road as the river bottom habitat is private property. Rewards: River Park is best in spring, fall and winter. Check the willows and cottonwoods adjacent to the river for migrant passerines. Look through the park pines for warblers and along the willows next to the river for sparrows. A check of the pond is occasionally good for waterfowl and may include a rare goose. Another bonus is the regular turnover of gulls that make their way to and from the coast in winter. This pond is a reliable place for Thayer's Gull, and in 2009 a Glaucous Gull was found among the gull flock. To the south, the dense riparian habitat along Sweeney Road allows one to see breeding flycatchers, thrushes, warblers, and chickadees, White-throated Swift is commonly seen above the bluffs here. Occasionally a Northern Pygmy-Owl may be heard calling from within the dense under-story or seen in the cottonwood trees. Look for buntings and grosbeaks along Sweeney Road. 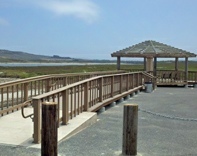 Rewards: Jalama Beach County Park is one of few north coast beach access points in the county. It is situated mid-way between Point Arguello on Vandenberg AFB, and Point Conception to the south. The drive along Jalama Road is characterized by grassy coastal foothills with areas of riparian habitat and oak woodland. In spring look for Ash-throated Flycatcher, Rufous-crowned Sparrow, Lazuli Bunting and Blue Grosbeak. 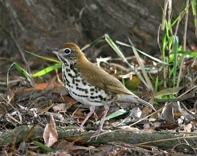 Resident species include Nuttall's Woodpecker, California Scrub-Jay, and California Thrasher. At Jalama Beach Park numerous gulls, terns, pelicans and shorebirds are found at the beach and creek estuary, while loons, grebes and cormorants are found in the surf. Spring and fall migrant passerines or an odd vagrant may be seen in the shrubs in the campground area and in the willows at Jalama Creek mouth.